Student Senate Vice President Valencia Scott rescinded the petition calling for the removal or suspension of Student Senate Director of Communications Tami Dunning hours after the judiciary committee that would make the decision to suspend or remove Dunning was formed at Thursday’s Student Senate meeting. Student Senate Adviser Juan Blanco said he knows why the petition was rescinded but wouldn’t say and instead referred all questions to Scott. Scott was reached via e-mail but declined further comment at this time “since the board is now moving past the issue,” Scott said. Dunning said that if everyone understood the bylaws, constitution, and Brown Act that we would not have as many disagreements and would avoid any similar issues moving forward. Dunning hopes that other members of the board will communicate with her more to clarify any misunderstandings. 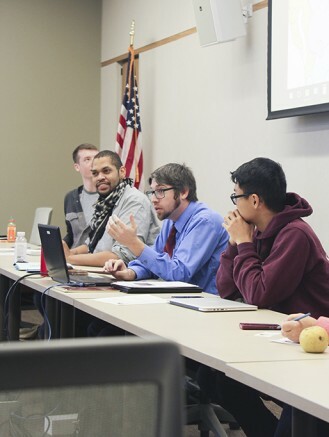 A bill has been proposed which allows the Student Senate to allocate up to $300 for training and consulting from Lorenzo Cuesta in parliamentary procedure for the spring semester. Lorenzo Cuesta is a professional registered parliamentarian accredited for doing work at Sacramento City College, according to Blanco and Dunning. Lorenzo gives Senate President David Hylton II advice on following parli-pro and Brown Act according to Blanco. “What I do is make sure college procedure, regulations, and the CA ed. code is followed,” said Blanco. Blanco said that they have been trying to get Lorenzo on board for a long time and it is not related to the Dunning incident. This bill states ASB Student Senate is in urgent need of ongoing consulting in parliamentary procedure to maximize the chances of success and even its existence. James Cortright expressed concern of needing the bill to more transparent. After Cortright expressed his concern, Hylton II then acknowledged a member of the public and asked him to state his name. The man identified himself as Daniel O’Neil, then said, as if to exemplify the senate president’s need for professional consultation, “I shouldn’t have to state my name due to Brown Act,” then continued. Daniel O’Neil is a student tutor at Sac City and has received training from Cuesta while he was vice president of Sac City’s Student Associated Council. After the meeting O’Neil said the key is making sure the rules are followed consistently and effectively which is what Lorenzo offers. 2 Comments on "Student Senate rescinds petition for removal of board member"
I believe that Director Dunning’s statement is incorrect that none of us other Board members reached out to her as I have my texts and emails. We were not, however, according to Advisor Blanco, allowed to discuss the removal petition while it was in effect. I also believe that the article headline is incorrect because I don’t recall the student Senate taking any action to rescind the removal petition. The petition was filed by VP Scott, and she withdrew it.